Co-publication in PVS seems to be a small-scale endeavour. The 213 collaborating authors publish in 78 distinct co-publication networks (components) which have a median size of just 2 members. Put differently, the vast majority of co-publication networks actually represent rather uninteresting one-off co-operations of two or three authors that never publish again in PVS, jointly, individually, or with other research partners. For identifying relevant co-operation networks, we chose a somewhat arbitrary threshold of six members per network. Applying this threshold elicits three components, which are small in absolute terms and in comparison with Britain. 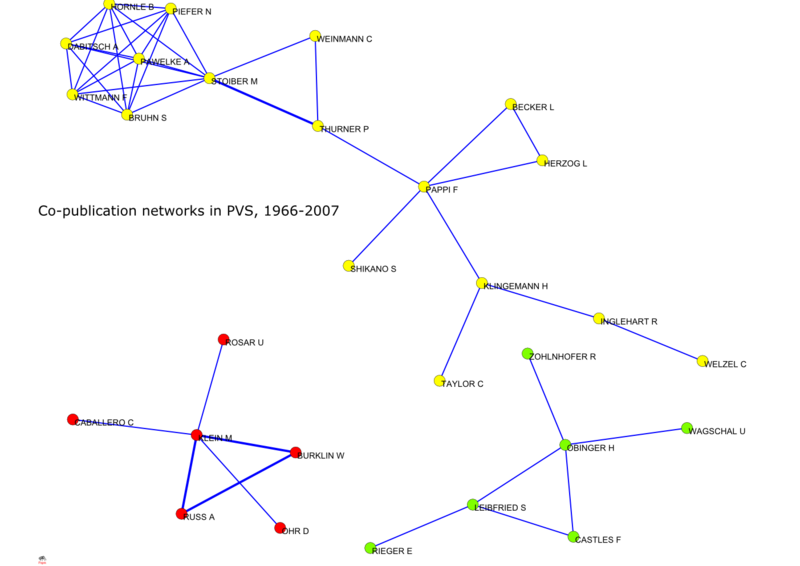 The first network is formed by a triad involving Klein, one of the most prolific contributors to the journal who has published two pieces with Russ and Bürklin as well as three more articles with different co-authors. The second network consists of another triad which has published a joint article, and three more authors that have published three articles with two members of the triad.